"Hello Barbie" Makes The Doll Interactive, But Is A Toy That Records What Kids Say To It Really A Good Idea? If you thought Barbie's vacant eyes and physically impossible chest were what made her creepy, you might have to add a few new features to that list soon — ones that have nothing to do with what she looks like. Apparently toy manufacturer Mattel has ideas for "Hello Barbie," a new interactive doll that will record what's going on around her. And then, just to make it as disconcerting as possible, she will send those recordings via Wi-Fi to a remote server, which will then devise an appropriate response. The doll will then talk back to your child. Creepy? Not creepy? I'm going with creepy on this one, but you be the judge. Hello Barbie is not supposed to hit stores until the fall, but privacy advocates are trying to keep that from happening. Susan Linn, the executive director of a nonprofit called Campaign for a Commercial-Free Childhood, called the interactive doll “dangerous” and pointed out that “kids using ‘Hello Barbie’ aren’t only talking to a doll, they are talking directly to a toy conglomerate whose only interest in them is financial.” Campaign for a Commercial-Free Childhood is calling on Mattel to halt production of the dolls. 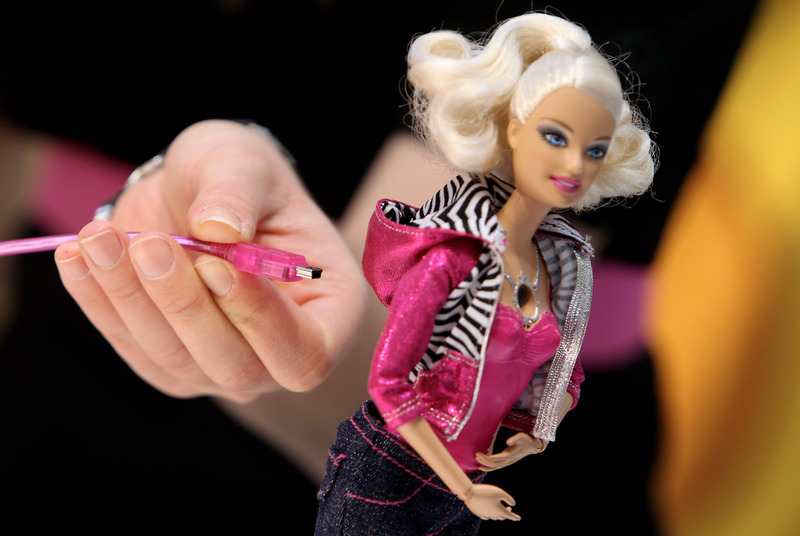 Angela Campbell, faculty adviser at Georgetown University's Center on Privacy and Technology, also noted, "In Mattel's demo, Barbie asks many questions that would elicit a great deal of information about a child, her interests, and her family. This information could be of great value to advertisers and be used to market unfairly to children." Others also seem to be worried about third parties potentially gaining unauthorized access to the audio information Barbie transmits. Hello Barbie is designed to pick up audio only when a button on her belt is pressed, so you probably couldn't use her as a full-on listening device; still, though, the idea of random hackers listening to children talk to their Barbie dolls is a little terrifying. As is the idea of having a conversation with a doll, to be honest. Mattel, for their part, insists that they have taken all the necessary precautions to keep audio files secure, and says that they have no intention of using Hello Barbie as a way to deliver ads to children. ToyTalk chief executive Oren Jacob assured consumers, "The data is never used for anything to do with marketing or publicity or any of that stuff. Not at all." There's still a concern, though, that advertising eventually would become a part of the gimmick. Once something gains the ability to speak directly to a large number of consumers, it usually doesn't take long for marketing to follow. All of these things are important and potentially the start of a very slippery slope, but personally, the part of this whole idea that I found most horrifying was the fact that parents can sign up to receive daily or weekly newsletters that let them access the audio files of their children playing with the doll. While supposedly this is to help parents keep on track of what information their child might be sharing, as someone who spent a lot of time saying utterly ridiculous nonsense to toys as a kid, the idea of my parents listening in on that is more than enough to make me want to hide the microphone deep in my toy box and never speak of it again. Mattel's sales are down, but I can't help but think that Hello Barbie just isn't a good idea. I mean, there are lots of ways to make dolls more interactive and 21st century than having them turn into eavesdropping device. Plus, as far as I can tell, putting all that electronic stuff in her hasn't inspired anyone to redo her proportions while they're at it, so really, the whole thing just doesn't seem to have upsides.